256 Science [Vol. LIX, No. 1524 lection of optical apparatus and machinery, for instruction and research, particularly in applied optics, optometry and physiological optics. On February 29 and exhibition of the apparatus was held in Fayerweather Hall. Mr. Adolph Lomb himself was present and also Mr. Max Poser, of the Bausch and Lomb Optical Company. President Butler accepted the gift on behalf of the trustees of the university and Dr. Herbert E. Ives, president of the Optical Society of America, delivered an address on modern progress on physiological optics. Dr. Philip Franklin, instructor in mathematics at Harvard, has been appointed to fill the vacancy in the mathematics department at the Massachusetts Institute of Technology caused by the death of Professor Joseph Lipka. Theodore H. Dillon, professor of electrical engineering at the Massachusetts Institute of Technology, has been appointed to the chair of public utility management in the Graduate School of Business Administration of Harvard University. Dr. J. E. Halloway, known for his work on the ferns of New Zealand, has been appointed lecturer on botany in the University of Otego, Dunedin. 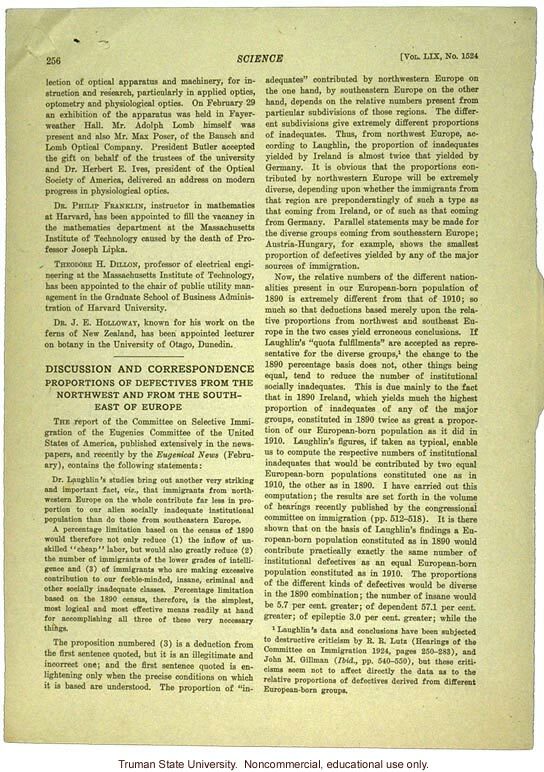 [score] Discussion and Correspondence Proportions of Defectives from the Northwest and from the Southeast of Europe The report of the Committee on Selective Immigration of the Eugenics Committee of the United States of America, published extensively in the newspapers, and by the Eugenical News (February) contains the following statements: Doctor Laughlin's studies bring out another very striking and important fact, vis.,that immigrants from northwestern Europe on the whole contribute far less in proportion to our alien socially inadequate institutional population than do those from southwestern Europe. A percentage limitation based on the census of 1890 would therefore not only reduce (1) the inflow of unskilled "cheap" labor, but would also greatly reduce (2) the number of immigrants of the lower grades of intelligence and (3) of immigrants who are making excessive contributions to our feeble-minded, insane, criminal and other socially inadequate classes. Percentage limitation based on the 1890 census, therefore, is the simplest, most logical and most effective means readily at hand for accomplishing all three of these very necessary things. The proposition numbered (3) is a deduction from the first sentence quoted, but it is an illegitimate and incorrect one; and the first sentence quoted is enlightening only when the precise conditions on which it is based are understood. The proportion of "inadequate" contributed by northwestern Europe on the one hand, by southwestern Europe on the other hand, depends on the relative numbers present from particular subdivisions if those regions. The different subdivisions give extremely different proportions of inadequates. Thus, from northwest Europe, according to Laughlin, the proportion of inadequates yielded by Ireland is almost twice that yielded by Germany. It is obvious that the proportions contributed by northwest Europe will be extremely diverse, depending upon whether the immigrants from that region are preponderatingly of such a type as that coming from Ireland, or of such as that coming from Germany. Parallel statements may be made for the diverse groups coming from southwestern Europe; Austria-Hungary, for example, above the smallest proportion of defection yielded by any of the major sources of immigration. Now, the relative numbers of the different nationalities present in our European-born population of 1890 is extremely different from that of 1910; so much so that deductions based merely upon the relative proportions from northwest and southeast Europe in the two cases yield erroneous conclusions. If Laughlin's "quota fulfillments" are accepted as representative for the diverse groups,[superior]1[end superior] the change to the 1890 percentage basis does not, other things being equal, tend to reduce the number of institutional socially inadequates. This is due mainly to the fact that in 1890 Ireland, which yields much the highest proportion of inadequates of any of the major groups, constituted in 1890 twice as great a proportion of our European-born population as it did in 1910. Laughlin's figures, if taken as typical, enable us to compute the respective numbers of institutional inadequates that would be contributed by two equal European-born populations constituted one as in 1910, the other as in 1890. I have carried out this computation; the results are set forth in the volume of hearings recently published by the congressional committee on immigration (pp. 512-518). It is there shown that on the basis of Laughlin's findings a European-born population constituted as in 1890 would contribute practically exactly the same number of institutional defectives as an equal European-born population constituted as in 1910. The proportions of the different kinds of defectives would be diverse in the 1890 combination; the number of insane would be 5.7 per cent. greater; of dependent 57.1 per cent. greater; of epileptic 3.0 per cent. greater; while the [footnote] [superior]1[end superior]Laughlin's data and conclusions have been subjected to destructive criticism by R. R. Lutz (Hearings of the Committee on Immigration 1924, pages 250-283), and John M. Gillman (Ibid., pp.540-550) but these criticisms seem not to affect directly the data as to the relative proportions of defectives derived from different European-born groups.